NOTE: When using the Hybrid rail on an AGD Emag the new solenoid plunger measurement is 2.9336" to 2.9386"
Introducing the new Hybrid RTP Rail. The new design features a redesigned sear pin that is an off the shelf dowel pin which uses two 4-40 set screws to hold it in place. Finished rails can be as long as the AGD ULE body. Its the thickness of an Automag rail and the length of the Original RTP rail and wide enough to cover many designs. Rails can be used with twistlock barrels, stainless steel and ULE bodies. A sear pin as short as 0.625" can be used. Rail designs will no longer be dictated by the factory sear pin. All rails will be sold with replacement sear pins and hardware. For those that don't know, all Lc Rails are manufactured from slug rails, they're the first step in all rail designs. Manufacturing of the slug rails begin tomorrow and will finish up this coming week. In the past, there were rail designs that were only available for the old Automag rails, now all those designs can be made from these slugs. Last edited by luke; 10-04-2018 at 10:07 AM. Sooooooo when's the am length karta rail coming? Also does the pin slide in similar to a micro mags? I would need the CAD file and permission from the owner to do them. Not sure, this is just an 1/8" hole drilled all the way through the rail. Hoping to grab one of these in AM Length, Epsilon style. How about doing a homage to the old eclipse style of milling to mag rails. A Lukes custom version of something done years ago might be interesting. The ones I've seen just have some notches on the back end of the rail, really nothing special, at least to me. Whats the point of the threadless sear pin ? To be able to better symmetrically mill both sides of the rail ? I have an eclipse mag that i can put up photos of later for ya... or I could send you to measure up. I have some design ideas... mostly stuff like an even narrower logic alpha, and a rail that is windowed. 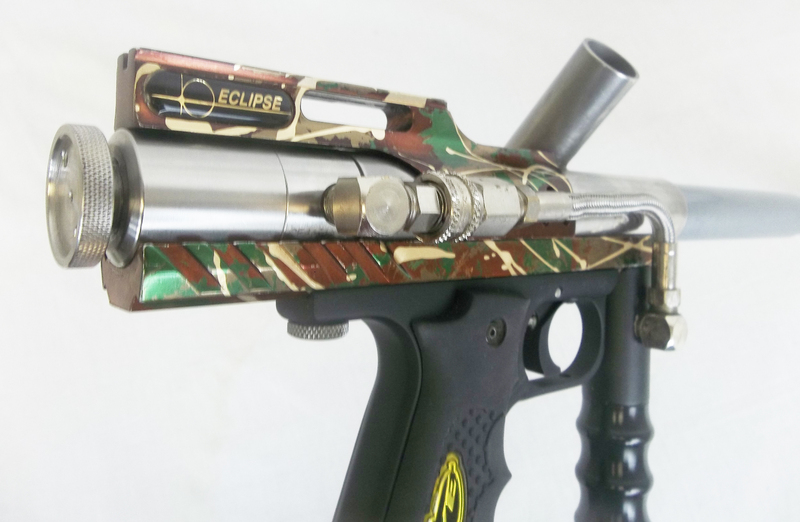 Heres the eclipse rail, right? Sear pins dictate rail design and even some bodies, all design concepts revolve around it, even the classic AM rail. Form follows function so there's no way around it. The ability to run a 5/8" long sear pin removes a great deal of design limitations. It also allows me to narrow the thickness of the RTP rail down to the size of a classic Automag rail. The factory RTP rail is thicker to make room for the threaded sear pin. Also, I think the best looking rail designs are done on the AM rail, the thinner rail just looks nicer IMO. Last edited by luke; 08-19-2018 at 11:07 PM. That's a easy redesign, we can completely remove the center pop out around the sear, just run the same width front to back, like a dog bone. Not gonna lie, at a first I thought there'd be no use for this design then I saw the EP block I have sitting waiting for a stock rail for me to hack up and a pistol mag I've been wanting to do and then thought never mind. No problem. I just designed one but need to add the ULE milling. I'll post a screen shot of the CAD when it's done. For sure. I've wanted to do the Wave Rail on the RTP Hybrid platform since before those were released. Looks good, I like the bottom detail, cleaner the the AM version, the rest of the design is identical to the old one. Last edited by luke; 08-20-2018 at 09:30 AM. I like that style a lot, are you doing pre-orders? If not, how far off from release are they? Last edited by Gundam V; 08-20-2018 at 07:56 PM. Rail is 3/4" wide to match most grip frames, lines up with the front of standard grip frames and a little longer in the back to help support the valve. The old style was a little narrow at .65" wide and left a little gap on a standard frame between the frame and rail. I widened this to .75" so it will match exact to the grip frame. I was also able to do away with the center bumps that were there for the sear pin. I was going to mill down an rt pro rail to make that... but i was going to go to 1/2" wide around the sear slot (or maybe some windows into the sear pocket shaped like either a series of holes or like the indents on the ule rails to give it an even slimmer look. That part sticking out behind the grip to support the valve seems boxy... how about either a 30-45 degree slope or step? Hell, I was gonna cut it off 100% but I get it... maybe a little meat for the valve. Dogbone looks sweet too. But I was thinking less rounded at the ends and more squared off/angular where it flares out front & back. Like a capitol "I" with serifs. I had a new idea for the front grip mounts too... but that will require me to draw something out. Last edited by JimBobFett; 08-20-2018 at 10:26 PM. If its rtp hydrid rail either epsilon or beta style. I'm on board for it, just let me know when your gonna start accepting payment for it. Also, I have one question, would you be willing to do a one off and make one that accepts winged trigger frames. Just got my hands on a z grip and wanna use it on this. Don't wanna mill off the wings on the frame.